#6. Black Moon - "Buck 'Em Down (Remix)"
In some ways, the Boot Camp was the forbear of the weeded pilot rap of Curren$y and Wiz Khalifa. Sure, Buck and 5 were more concerned with guns and blunts than streetwear brands and bongs, and their albums were far more consistent, but the intent and construction is strikingly similar: laid-back stoner rhymes over deep and spacious boom-bap. It's all smoke-something music. 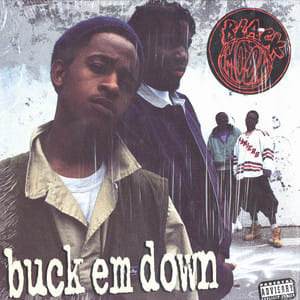 One could even draw a more direct line with the "Buck 'Em Down (Remix)," as Buckshot works his own airplane analogies on the intro.